There are certain moments in life that, when looking back, stand out above the rest. It’s no different in scientific discovery – a journey of exploration, where important discoveries pave the way for the breakthroughs that change lives. Here are some of the most influential advances in dementia research over the last century – thank you for helping to make them possible. 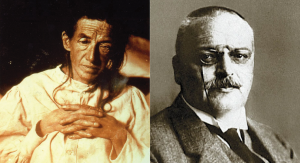 Dementia’s journey of discovery began when Dr Alois Alzheimer examined the brain of a lady called Auguste Deter, who died after experiencing symptoms that we would now recognise as dementia. Under his microscope, he discovered a build-up of proteins, which scientists later went on to characterise as ‘amyloid’ and ‘tau’. Over 100 years later, these proteins are still seen as key players in the development of Alzheimer’s and many other dementias. The discovery laid the groundwork for the development of spinal fluid and brain scan tests that are used in clinical trials and in some cases, to help make an accurate diagnosis today. They also paved the way for current efforts to develop life-changing new treatments. There are drugs currently available that can help improve symptoms in some people with dementia. In 1976 researchers found evidence that levels of a chemical messenger in the brain, called acetylcholine, were lower in people with Alzheimer’s disease. This moment was a stimulus for a cascade of research that led to the development of the drugs used to treat Alzheimer’s and dementia with Lewy bodies today. These drugs, known as cholinesterase inhibitors, work by boosting the levels of acetylcholine in the brain and can help to improve people’s thinking, memory, communication or day-to-day activities for a time. They include: donepezil (Aricept), rivastigmine (Exelon), and galantamine (Reminyl). While these effects are often temporary, and these drugs are not a cure, thanks to scientific discoveries, these drugs have now helped millions of people to manage their symptoms and have a better quality of life for longer. The identification of a rare genetic fault that causes Alzheimer’s in some families precipitated a huge leap forward in our understanding of the disease. This truly landmark discovery implicated the build-up of the amyloid protein as the event that kick-starts damage to nerve cells in Alzheimer’s. This idea, known as the amyloid cascade hypothesis, has been central to Alzheimer’s research for nearly three decades. Families with inherited Alzheimer’s, who volunteered to take part in genetic research, were instrumental in making this discovery possible. Today, those families are able to take a genetic test to find out whether they will develop the disease and plan their life around the result. In this powerful blog post, Alzheimer’s Research UK supporter, Jess Fleig, talks candidly about how this breakthrough affected her life. Amyloid is also now the target for many drugs in development, including aducanumab and BAN2401. These drugs, now being tested in late-stage clinical trials, are the front runners in the race to develop the first treatment that can really slow the progression of Alzheimer’s. Alzheimer’s Research UK Patron Prof John Hardy, who led the team that made this discovery, recently received the prestigious Brain Prize, honouring his outstanding contribution to neuroscience. Earlier this year Prof Hardy spoke to us about important developments in dementia research. In the mid-90s researchers found evidence of changes in the levels of amyloid and tau protein in the spinal fluid of people with Alzheimer’s. 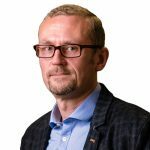 In the years since, researchers have been working to refine the analysis of spinal fluid samples and how they could be used to improve diagnosis and research. While there is still no definitive biological test for diseases like Alzheimer’s, steady improvements building on this initial discovery are beginning to bear fruit. Earlier this year clinical guidelines were updated to highlight the potential benefits of spinal fluid tests to aid in the accurate diagnosis of Alzheimer’s when the exact cause of someone’s symptoms are uncertain. But the future potential of these ‘fingerprints’ is even greater. Brain changes like the build up of amyloid can get underway up to two decades before symptoms show and research suggests that spinal fluid tests could provide a means of identifying people in these early, pre-symptomatic stages. Alzheimer’s Research UK is working to capitalise on this existing research, to develop sensitive ‘fingerprints’ in spinal fluid and blood to help detect and diagnose the diseases that cause dementia 10-15 years earlier than we do today. This will allow us to tackle these diseases sooner, when we know future treatments are likely to be most effective. Although scientists have long suggested a link between Alzheimer’s and the immune system, a landmark genetic discovery helped to focus attention on this important relationship. In research co-funded by Alzheimer’s Research UK, a global research team discovered a change in the DNA code of a gene called TREM2. TREM2 helps to control the immune system, and people with this change in their TREM2 gene have a three-fold higher risk of Alzheimer’s. Research is now showing inflammation to be a key early feature of Alzheimer’s. Scientists are now building on this discovery and drugs targeting the immune system are a major focus of research at the Alzheimer’s Research UK Drug Discovery Alliance. Dementia is not an inevitable part of ageing and there are things we can all do to help keep our brains healthy. These were highlighted in a 2017 report from the Lancet Commission – a comprehensive piece of work part-funded by Alzheimer’s Research UK. The report summarised the latest evidence, estimating that around 35% of dementia cases could be prevented by eliminating nine risk factors linked to the condition. As well as highlighting established risk factors for dementia, like high blood pressure and physical inactivity, the report also pointed towards hearing loss as an emerging new focus of attention. The review highlighted the importance of population-wide brain health messaging – a strand of work that Alzheimer’s Research UK is committed to supporting. Since the report, we launch The Mike Gooley Trailfinders Charity Prevention and Risk Reduction Fund, the UK’s largest charitable investment in dementia risk reduction research. The fund is currently supporting four innovative research projects which are taking up some of the biggest challenges in risk reduction research. While these are some notable examples of progress, dedicated dementia researchers are making advances every day and your support is making their work possible. With your continued support, our mission is bold and clear – to continue to power incredible discoveries in research and translate them into breakthroughs that change the lives of people with dementia. Find out more. Thank you for your kind words, Joan. We hope people like our message of hope! Very interested to read your article and the good work you are continuing to do in respect of reducing and treating this horrible illness, the only one which stops’ you’ being’ you’. You should be at least partly government funded and indeed, as well as saving many people and their families from going through such an unpleasant (a totally not strong enough word) it would make absolute sense to provide funds as in house treatment in hospitals and homes would be reduced thereby saving money. I have been supporting Alzheimer’s research since my Mum was diagnosed with the disease. It is truly distressing for all the family to see a vibrant woman so reduced. I agree with Margaret Pollard that there should be government funding & would also point out that controlling this disease would ease the State’s burden of care which we are all committed to & which is so very frequently referred to by all forms of media as being unsustainable in the long term without raising taxes. As a member of the ageing population -which we are now being reminded about far too consistently – I would hope that I would be able to remain in my own home, look after myself & my disabled husband, & keep my happy – & sometimes not so happy – memories. With help from your research I may be able to attain this goal. What a relief that would be for my son & daughter.